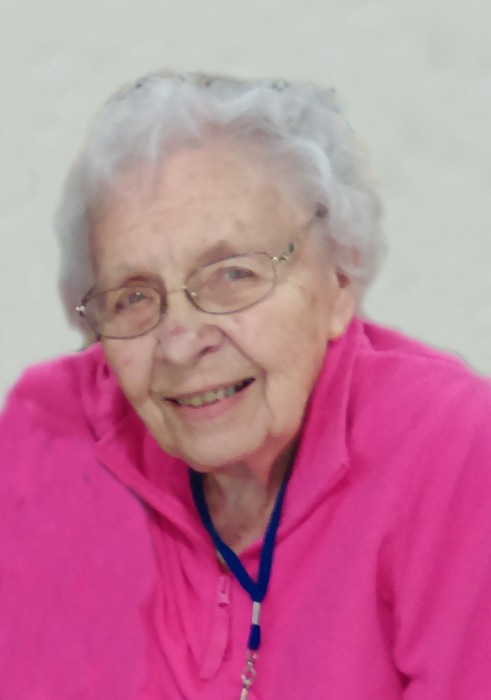 Grace D. Kranz, age 93, of Litchfield, died on January 22, 2019, at the Meeker Manor Rehabilitation Center. A memorial service will be held on Saturday, January 26, 2019 at 11:00 AM at First Lutheran Church in Litchfield. Visitation will be held one hour prior to the service at the church. Interment will be in the Ripley Cemetery at a later date. Grace Dorothy Kranz, the daughter of John and Clarise (Swanson) Anonby, was born on January 23, 1925 in Faribault, MN. She was baptized on March 12, 1925 at Hauge Lutheran Church. Grace spent her childhood on a farm in Kenyon with her 8 sisters and brothers. When she was 7 years old she had to milk cows before going to school. Grace was confirmed at Hauge Lutheran Church on October 29, 1939. She graduated from Kenyon High School in 1942. She then moved to the cities and joined her older sister, Ruth. She got a job as a private secretary to Harry D. Hawpek for 4 years. On July 10, 1948, she was united in marriage to Douglas Kranz at Mount Olivet Church in Minneapolis. Doug’s dream was to go farming. They bought a small farm in Rush City only to have a tornado come through and wipe out every building, but the house. They were forced to sell and then they went farming on shares with an older couple, eventually buying that farm. They lived there from many years before Doug heard about a farm near Litchfield that was for sale. In 1973 they bought the farm near Litchfield where they lived until they retired and moved to a home in Litchfield in 2004. She was a member of the First Lutheran Church. Grace enjoyed crafts, gardening, playing cards and puzzles. She is survived by her daughters Barbara Peterson of Crystal, Joanne (Don) Kern of Eagan, Lisa (Mike) Steichen of Litchfield and sons Doug, Jr. (Harriet) Kranz of Darwin, and Jeff (Karen) Kranz of Litchfield. She is also survived by her grandchildren, Shelly Confair, Robin Yardley, Jason Kern, Christopher Kern, Ben Kranz, Luke Kranz, Nick Kranz, Jacob Steichen, Mathew Steichen and Adam Steichen, great grandchildren, Malenny Kranz, Ben Kranz Jr., Hunter Confair, Reyna Yardley, Ryder Yardley, Hailey Kranz, Chelsea Kranz, Adelyn Kranz, Keira Kern, Payton Knisley, Kadence Kranz, Brandtly Kranz, Dominick Steichen and Logan Steichen; sisters Cecile Wilhardt and Eileen Simon. She was preceded in death by her parents, husband Douglas Kranz (November 23, 2010), grandson Jess, sons-in-law Jim and Ray; brothers Georgie, Harry, Robert and Johnny; and sisters Alice and Ruth.